Home » Articles » How To Start Trading Binary Options? If you’d like to start trading binary options, I highly recommend trying the demo account for the first couple of months. The main reason is: you need to fully understand how everything works, especially the market. The first thing we need to do is to choose a broker you’ll be trading with. If you are not completely satisfied with the services of that particular broker, you can always withdraw your money and try another one. A list of trustworthy brokers that I’ve put together can be found here on our website. As an example, I’ve chosen the broker StockPair which is, in my opinion, suitable for beginners and also belongs to our favourite brokers. Second thing you need to do is to create an account. After clicking “Open Account”, you’ll see a form with a couple of details that are necessary to create an account. Fill it in and click “Save and continue”. On the next page, you’ll fill in other details about yourself. It will only take a couple of minutes and you’ll be doing this only once. When you’ve completed the registration, the system will automatically log you into your newly created account and will transfer you to the page where you can deposit you money. Choose your payment method, fill in the form and click “deposit” Wait until they load into your account. If you’re using a credit/debit card, the money will be transferred within seconds. 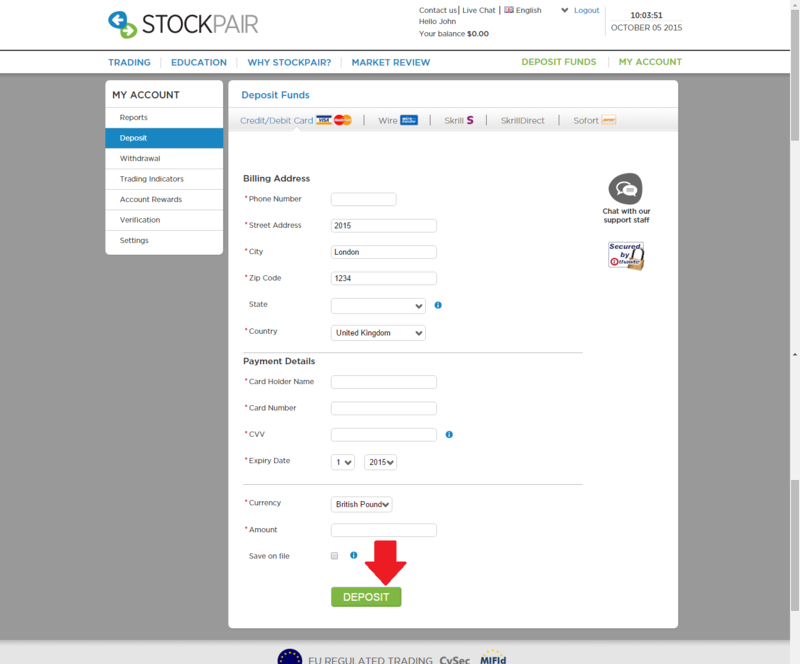 After a successful deposit, you can check your account balance in the top right corner of the website. In the menu choose the option “Trading”. Here you’ll find a lot of things that may look really complicated at first, but in fact, it’s all really simple. So let’s have a look at what all these things mean and what do they do. 2) Sentiment. This column shows what traders and investors do. CALL means, that other traders on Stockpair think, that the price will increase and thus buy CALL options, PUT means the exact opposite. 3) Selecting an asset. Here, you’ll choose an asset you are going to trade, ranging from commodities, stocks, indices to currencies. 4) Panel of investment. After making a decision and clicking CALL or PUT, here you can select the chosen amount of investment and you’ll directly see how much money can be won or lost. 5) All open options. If you’ve made a bet, here you can see how it is turning out. 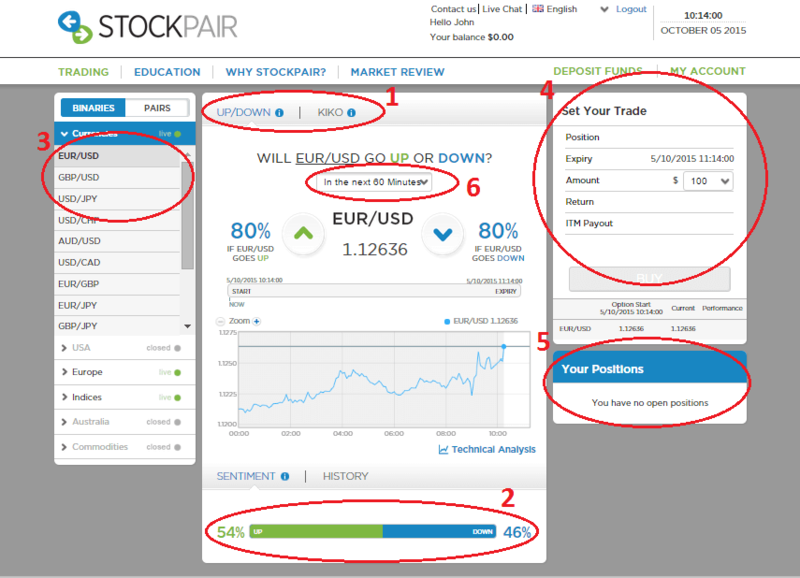 Everything has been demonstrated with Stockpair‘s interface, but don’t be afraid. All the brokers work very similarly. As you can see, everything is very easy and brokers’ platforms are very intuitive and user-friendly. If you have any questions, do not hesitate to leave a comment below.